You gain reputation when questing in Azsuna. The majority of quests, rewards reputation. This is the first way you will gain reputation if you level up your char there. The second way of gaining reputation with Court of Farondis is when you are max leveled (110). When you hit max level you will find World Quests when opening your map. 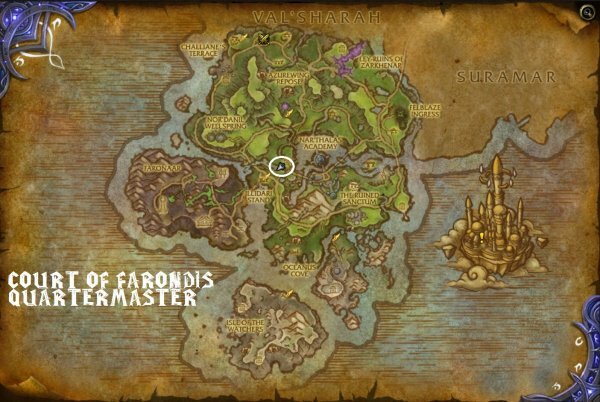 Click on Azsuna and you will find various quests tied to Court of Farondis. Mouseover on a world quest will give you information on what faction that quest is tied to. Completing that quest will reward you extra reputation. For a full guide on World Quest, follow this link. The third way of gaining reputation with Court of Farondis is to farm the dungeon Eye of Azsuna. Endboss kill rewards you 250 reputations. Fourth way: Do Kirin Tor world quest. Kirin Tor world quests do reward reputation for the other legion factions. In this case it is based on where the quest is located in the Broken Isles. Kirin Tor world quests in Azsuna rewards Court of Farondis reputation. 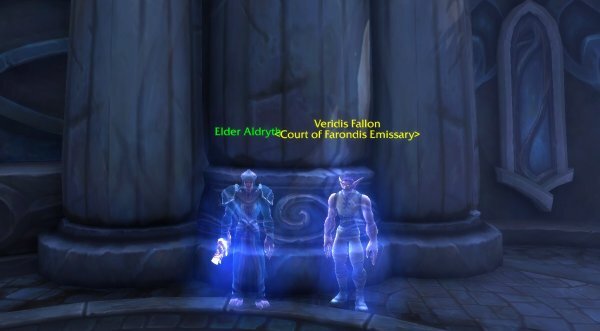 Fifth way: Do the Kirin Tor Emissary World quests. Completing 4 quests for Kirin Tor, when the Emissary World quest is up will reward you with one insignia of choice. The Insignia gives 1500 reputation to any reputation faction in the Broken Isles except Nightfallen which gives 750 reputations instead. 6th way: Do the Wardens World Quests in Azsuna. The reward will be reputation for the Wardens AND for Court of Farondis(for example if the reward is 250 rep, you get 250 for The Wardens and 250 for Court of Farondis. At the moment on Beta version the profession rank upgrades requires only neutral with Cort of Farondis, this might change. Reveals treasures on the minimap of Azsuna for 1 hour. Summon the Sand Piper tied to the Enchanted Stone Whistle. Teleport to a Ley-line point in Azsuna to try and find one of the lessons. The reputation vendor for Court of Farondis is called Veridis Fallon (Court of Farondis Emissary). Veridis is located in Crumbled Palace – Azsuna.